Recently, a philosophically oriented friend who believes in Yeshua wrote me, asking, “What if we are wrong about this? Ultimately, how can we know it is really true?” What follows is a slightly edited version of the answer I gave to that question. Perhaps you or someone you know will find it interesting or helpful. Many people will give you different answers to your question, and in truth, the answers to it are many layered. People will talk about Messianic prophecy. They will talk about his resurrection and the way this fact and conviction took hold very strongly in a small group of discouraged disciples, revolutionized their lives and relationships, and spread throughout the ancient world like wild fire. They will discuss personal experience, healings, and other evidences historical, communal, and personal. But this is the answer that rose in my heart when I read your question this morning. 1) There are different kinds of knowing, and therefore different kinds of proof. There are even different kinds of faith-knowledge itself. Ultimately our knowledge and proof of Yeshua as Messiah is parallel to the knowledge and proof that Moshe Rabbenu had that HaShem, the God of his fathers had indeed met him at Mt Sinai and was indeed sending him despite his own sense of personal inadequacy. Ki ehyeh imakh. Ki zeh-l’kha ha’ot ki anokhi sh’lakhtikha; b’hotizakha et ha’am mimitzrayim ta’avdun et ha’Elohim al hahar hazeh – “I will surely be with you. Your sign that I have sent you will be that when you have led the people out of Egypt, you will worship God on this mountain (Shemot/Exodus 3:12). What is at the core of this particular kind of faith knowledge that Moses experienced with respect to HaShem and which we experience with reference to Yeshua? In verse eleven, Moshe Rabbenu asks, “Mi anochi ki elech el par’oh v’ki otzi et b’nai Yisrael mimitzrayim? – Moshe said to God, “Who am I, that I should go to Pharaoh and lead the people of Isra’el out of Egypt?” What is Moshe really asking? It is one question with two interactive aspects, one is apparent and the other is hidden. So again, in the midst of these two kinds of doubts, hidden and apparent, there must be an openness in the potential knower. Moshe Rabbenu’s openness is apparent in that he asks the question, ““Who am I that I should go to Pharaoh and bring the children of Israel out of Egypt?” Indeed he asks a series of questions repeatedly revealing his doubts about himself and about the alleged revelatory encounter he is having. And yes, those who love G-d and those who love to think about Him are right in saying that we will discover in retrospect that it is the unseen G-d who drews us to ask the questions. We see this in the experience of Moshe Rabbenu, because the bush burned prior to Moses’ inquiry—it was the burning bush that drew Moses to inquire. Similarly, it is still God who draws us to inquire today. In fact, it is God who draws us to wonder about Yeshua, about the validity of our experience, and to seek a deeper certainty about the validity of our claims about our faith experience and about his credentials. Similarly, persons of faith, (potential) faith-knowers, experience a spiritual spark, a little flame of faith that lights up this question within them. God has already spoken to them, and inside, often in a manner they cannot describe and that has no specific weight or overwhelmingness, they have sensed God’s word of reassurance—“I am here, I am with you, I will be with you,” etc. And this happens also in the context of Yeshua-faith. 4) The proofs and therefore the certainty of this faith-knowledge are proportional to the degree to which we give ourselves to the fulfillment of the conditions or commission divinely laid upon us. The ironic thing for Moshe Rabbenu at this time is that he is asking for an ex ante faith, a prior faith, “How shall I know now that you are going to do that then?” God’s answer is marvelous. It is this: “When you have led the people out of Egypt, you will worship God on this mountain.” In other words, it is only AFTER or AS Moshe obeys that he will know. This is so very true, and I can assure you this has been my experience and that of uncoountable others as well. It is in the doing of God’s will, in the actualizing of this flicker of faith that one experientially discovers its validity. Then Kefa called to him, “Lord, if it is really you, tell me to come to you on the water.” 29 “Come!” he said. So Kefa got out of the boat and walked on the water toward Yeshua. 30 But when he saw the wind, he became afraid; and as he began to sink, he yelled, “Lord! Save me!” 31 Yeshua immediately stretched out his hand, took hold of him, and said to him, “Such little trust! Why did you doubt?” 32 As they went up into the boat, the wind ceased (Matt 14). Shim’on had to get out of the boat in order to experience the faith proof he requested of Yeshua. For him, as for Moshe, as for me, and as for you, he had to give himself to the fulfillment of certain conditions in order to find faith-validation. In this case, he had to get out of the boat and step on the water! In Moshe Rabbenu’s case, he had to go to Egypt and, amazingly, deliver an entire nation. Be willing to do the will of God, whatever that is. Yeshua said “If anyone’s will is to do God’s will, he will know whether the teaching is from God or whether I am speaking on my own authority” (John 17:17). Exercise faith, ask, seek, knock as a habit of life. This of course involves praying. Sometimes God surprises you but you need to ask. Take up one’s cross and follow—accept the disgrace of identification with him. Have a Shema kind of faith in him—Just as the Shema says to love HaShem with all our hearts, with all our souls, with all our minds, so Yeshua told us that “So every one of you who doesn’t renounce all that he has cannot be my talmid” (Lk 14:33). There needs to be an element of self-abandonment in any sort of genuinely following God. Abram could not follow God without leaving Ur of the Chaldees. He couldn’t stay where he was and as he was and yet follow where God was leading. So it will be for us, and so was it for the early disciples of Yeshua. We have to leave our nets to follow him. Realize that Moshe Rabbenu experienced his faith-validation in company with all Israel. We need community and experience the validity of our faith in company with others, and for now, sadly, that is something you lack. 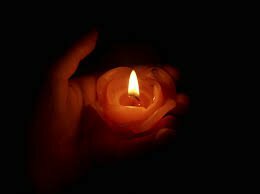 You need a community of like faith to sustain your own flicker of faith as you tend that little flame. 5) Realize that the realities of God’s Kingdom are often counterintuitive. On the face of them they look utterly ridiculous. This is characteristic of God’s dealings. The Jewish nation, as many as the stars of the heavens or the sand of the sea begins with a husband of 100 and a wife of 90, the latter past menopause. Moses is 80 years old, tending his father in law’s sheep when he is called to deliver the entire Jewish people from an Egypt which he had fled as a political fugitive forty years previously. The Jewish people are God’s chosen people, and have been persecuted and murdered throughout their history, and for nearly 2000 years without a homeland. Yeshua of Nazareth is butchered on a Roman cross, subject to derision and scorn by the leaders of his people, and dies with his disciples scattering for cover. Yet he rises from the dead, the prototype of the New Creation, embodied immortality, destined to rule over the nations and Judge all. So embracing Messiah will be seen as pathetic and ridiculous—but God prefers to work through such pathos and apparent impoverishment. 6) There is an intermingling of faith that produces experience and experience that produces faith. For Moshe Rabbenu, as he went back to Egypt on faith, and began to experience the miraculous interventions of God, his faith was validated and grew. Faith led to experience, and experience led to faith. So it will be for us. In my own life for example, I have seen God intervene in miraculous ways repeatedly and from time to time, but not constantly. One still has to endure the dry times in order to appreciate the rain of God’s provision. All of these things will prove true for you as well. 7) Realize that faith can flicker when we turn away from the object of faith to look at ourselves and at our arguments for what we believe. C.S. Lewis said that there is no divine truth we are more inclined to doubt than the one we have just defended because when we defend a divine truth, our attention shifts to our own defense of it, so we are not so much believing a truth, responding to an encounter, as trusting in or not trusting in our own explanation of that encounter. The two are not the same thing. Besides the answers I have given this morning, there are others that people will offer. Perhaps we can consider their merit together some time. I would just remind you that the certitude that God gives us, the validation of our faith, is conditioned by the nature of what we are speaking about. It is a different kind of knowledge than other kinds of knowledge, but a true knowledge just as well, just as people in love have a knowledge about the validity of their love which is different from mathematical proofs. to digest unbridled small article! Yasher koach! Good to know, Tony. Give it some sober consideration.